“Moonspell started in early’90s in the room of a friend. An idea who’s reality we follow every day refining and evolving by everything we learned since then. In 2011, in the present, we are about to make a trip to the past while our senses are seduced by the future, for our new album. In 2011 we know that a band not only combines a tense but is composed of three times, past, present and future. It’s like a large picture that is seen in its fullness. 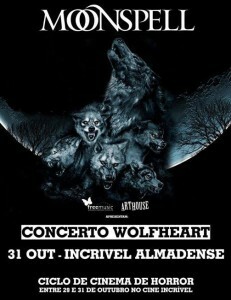 On the 31st of October we will present one of the most beautiful and important images of this photograph, playing in its entire and in order all songs that compose our first album Wolfheart. Wolfheart was released in 1995 and since then has sold over 150,000 copies worldwide, has been licensed in countries such as Russia, Mexico or Thailand (on tape), and CTT stamp was part of the lives of thousands of people. It is with genuine pleasure that we present it this way the first time in the country that inspired us in, the hall that saw us take the first steps exactly at that time. The concert will consist of a first part where the disc will be play in full but not only this with all pleasure we’ll be back on stage to play songs from all our times. After us in Cinetheater of Incrivel Almadense, we have Opus Diabolicum, the string quintet and percussion, created as a tribute to Moonspell of five young classical musicians children of the heritage started with Moonspell that already shared the stage with us (on Sombra tour) and prepare to step with us on the most important stage of Metal: the Wacken Open Air in August 2012. They will play some of his pieces for all of you here tonight at FNAC. To enter the concert of Opus Diabolicum in Almada you must pay attention to the Moonspell official page on Facebook there will the list of invites will be published for the end of this special night.